The world’s first commercialized eye-tracking system for general healthcare and wellness. It’s designed to quickly, easily and accurately expose vision and brain health in ways impossible with standard eye tests. 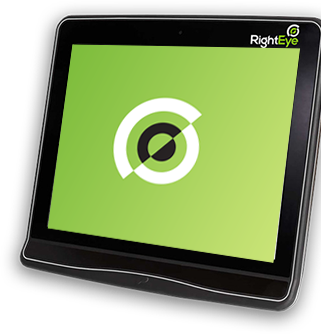 Right Eye (similar to VividVision) is computer based eye-tracking software and equipment. At Bolton Optometry, we use it to detect muscle imbalances and diagnose how the eyes are tracking. Whether this is the first you’ve ever heard of eye tracking or you’re just in need of a refresher, RightEye is here for you. The information your Bolton optometrist gains assists in the diagnosis and treatment of traumatic brain injury, post-concussion vision disorder, convergence insufficiency, reading problems, and more. Involuntary eye movements — typically not apparent to the naked eye — indicate visual performance and health concerns. 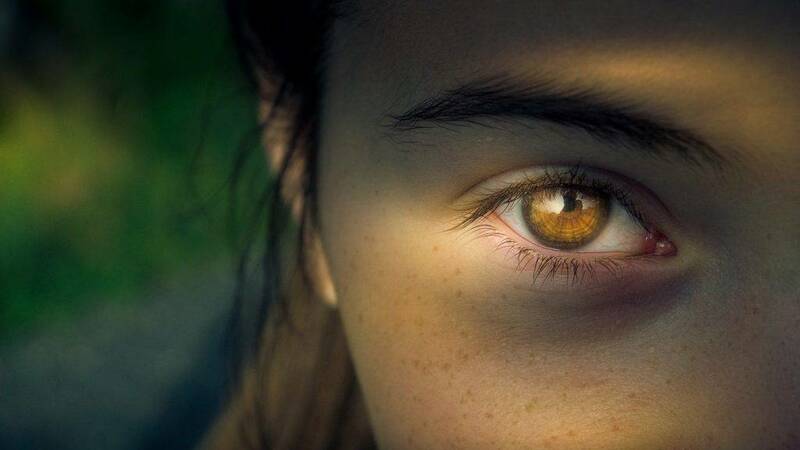 By measuring and analyzing these otherwise imperceptible patterns, doctors can identify and offer treatment to correct a host of vision and health issues as well as increase visual performance. Remember: vision is not the same as eyesight. A person with 20/20 eyesight may still exhibit weak eye movement behaviors. Eye-tracking technology, which is both objective and non-invasive, captures pictures of eye movements (30-250) times a second. The data produced is quantitative—meaning, it allows physicians to identify vision and health issues in a measurable way. It can assess, and improve, the experiences of athletes. And it can track recovery and identify improvements. As far back as the 1980s, eye-tracking science and research languished in the halls of academia, only occasionally stepping out into the real world. Yet, during this time, vast amounts of health and vision research and testing created a cumulative understanding of how our eyes work and how they’re connected to the brain; how injuries and illness change how our eyes function; and how eye tracking training can aid in recovery and improve vision performance. 1862. It’s called the Snellen chart after its inventor, the Dutch ophthalmologist Hermen Snellen. While today most doctors use the updated LogMAR chart, it does the same thing: measures how well we see at static images at a distance of 20 feet. Yet, because we primarily rely on vision while our eyes, bodies or objects are in motion, only about 5% of vision problems are identified with an eye chart. This is insufficient for everyone—children, in particular. 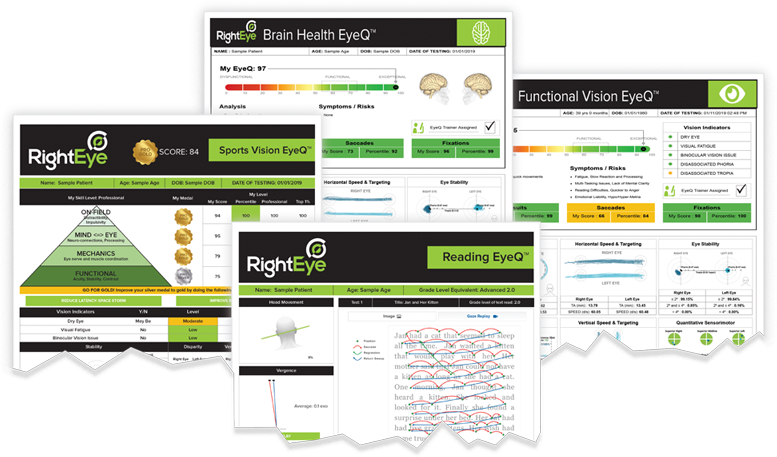 RightEye’s objective, quantifiable results are presented in easy-to-read EyeQ reports. Clearly organized with patient-friendly graphics and charts, these objective assessments translate hundreds of collected metrics into actionable opportunities for improvement. RightEye Placed Among Top Digital Health Trends. The First Automated Test Designed to Measure Dynamic Vision Skills That Impact Quality of Life. Which EyeQ is right for you? Functional Vision EyeQ instantly uncovers eye-movement issues. RightEye’s uses advanced eye-tracking technology to quickly and objectively identify a host of functional vision issues that impact quality of life. Headaches? Problems with coordination? Feeling “off” or “just not right”? These can be examples of how a person’s health is affected by vision problems. At your fingertips: an easy-to-read analysis that can better everything. Functional Vision EyeQ reports are quantifiable evaluations, which help eye doctors see precisely how their patients see. The reports also automatically recommend a personalized EyeQ Trainer treatment program to be done from a home computer. But it’s even bigger than that: the reports’ graphical charts and diagrams make it easy for patients to understand their own vision status—a key component of better doctor-patient relationships and increased participation in treatment. No more “follow my finger” tests. Eye movements can reveal how well the brain is working. But the classic “follow my finger” test is limited by, well, the finger. This subjective evaluation is imprecise for even the most skilled practitioners. There has never been a high-precision measurement tool for eye tracking. Until now. RightEye uses advanced eye-tracking technology and scientifically verified protocols to give patients a deeper, clearer evaluation of their brain’s levels of activity. Our five-minute, non-invasive assessment uncovers eye-movement patterns that may be the result of neurological problems and helps care providers quantify changes. And it provides all of this data in a nice, neat, easy-to-read report. The report that identifies, quantifies and astounds. The Brain Health EyeQ report is a graphical, patient-friendly presentation of advanced metrics. It showcases the severity levels of vision skill problems and how this may relate to brain performance. Using the EyeQ report’s measurements allows doctors to identify issues and then make recommendations for improvements, which may include RightEye’s EyeQ Trainer. One in four children has a vision problem that affects learning. Even children with 20/20 eyesight can have vision issues at the core of their learning problems. In fact, 50% of vision disorders go undiagnosed. Why? They share the same symptoms as many learning disabilities, including letter reversals, poor handwriting, low comprehension, short attention span, disinterest and more. RightEye sees how a patient sees. The RightEye eye-tracking system reveals how children see and, if needed, recommends customized EyeQ Trainer exercises that are done at home from a patient’s personal computer.